I have been asked several times in the past few weeks for advice on how to organize one’s work for preaching by people who were starting out as preachers seeking advice from other experienced preachers on how they do the work. The following are some observations I shared with these men based on my work and my experience. I emphasize this because each preacher probably has an approach and method that works perfectly for them that would not be as effective for another preacher. Although the work of the preacher is broad, this article focuses on how I approach sermon planning and development. Every three to six months I review the list of lessons that I preached in the last 3 or 6 months and identify the topics/subject areas I need to preach on in the next 3-6 months (and even some topics to consider in the next review period that won’t fit into the next 3-6 months). As best as I can I set up a calendar with the topics that I want to preach on which dates. I do not make this so concrete that I cannot intersperse lessons that need to be preached on needs that arise during this period. Flexibility is extremely important. This approach helps me balance the lessons that are more in-depth studies with ones that are more exhortation and not as mentally taxing. I would also look for other areas to keep balanced such as lessons focused on Old and New Testament topics. I keep a list of sermons I’ve preached by date and place and keep each year in a separate tab on a Google Docs spreadsheet (I share this with the man who posts the sermons online so he knows what title to use for the lesson). This helps me make sure that I cover a wide range of congregational learning needs, planning my personal study applicable to the sermons, avoiding the mind blank question, “What am I going to preach on Sunday?”, and prevent unnecessary redundancy in the topics on which I preached. When preaching full-time, I would usually schedule Friday and Saturday off (assuming no emergencies) but often needs arose to which I would be called. However, having this in mind saved me from having to work late on Saturday trying to get something ready for Sunday–a problem compounded if there was also an emergency on Saturday to which I would be called. I would start my sermon prep on Monday morning. My goal was to have both sermons and the Bible classes completed by Wednesday. Those three days would be focused on the study for the lessons, writing them out, and preparing the visuals. Some of the more in-depth lessons might be developed over the course of multiple weeks but that need would be identified in the planning process. This allowed me to have Thursday for in-depth study on a topic of personal interest that I wasn’t necessarily preaching or teaching on at the time. (of course, there were hospital visits, visits with members, studies with non-Christians and new converts, etc. interspersed during this time). The best thing I did when preaching full-time was getting a calendar broken down in 15 minute increments (appointment calendar). I wrote down everything I did in the time slots (what I studied, who I called, which sermon/class I worked on, reading, visits, etc.). At the end of the week I calculated to make sure that I had at least 40 hours of legitimate preaching work (generally more than 40 hours but if a “4o hour week” is the minimum in the work world, how much more should one be working hard in his labor for the Lord’s kingdom). More importantly, as I reviewed each week I could identify ways to make my work more efficient or identify time intensive activities that might be better assigned to or shared with someone else. For example, there was a lot of time spent on folding bulletins–so I changed to a format that did not require folding or making sure everything was centered for the fold. There was also work that I was doing that made more sense for one of the deacons or interested members to do to allow me to focus more on the study and give that members something to do that contributed to the growth of the congregation. In fact, I found members who were eager to help with correspondence course mailings, etc. Since, based on planning, I know what I want to preach, I rough out some ideas that I want to cover–not an outline, just some main points and questions I want to answer from my study. The greatest focus of the preparation is immersing myself in the texts related to the lesson to first learn the message of the scriptures. Through the study, other points usually reveal themselves and occasionally eliminate some of the main points I was going to emphasize. This study is the bulk of the work as it should be. I then sketch a Mind Map to develop the order of the lesson (Mind Maps are great tools for planning and organizing thoughts). Working from the Mind Map I write the outline of the lesson. I then go back through and see what areas need illustration or further explanation. After writing the outline, I do a sweep to see what I need to trim from the lesson. There is an important concept from the writing world: kill your darlings. Sometimes you have a point that you really like or an illustration that seems so good but, in all honesty, it detracts from the lesson or goes on a tangent. Have courage and remove it. Like I note in the next paragraph, you can make use of it in other ways but don’t fall in love with a point or illustration and let the rest of the lesson suffer as a result. The most practical piece of advice I give to other preachers is don’t do anything once. 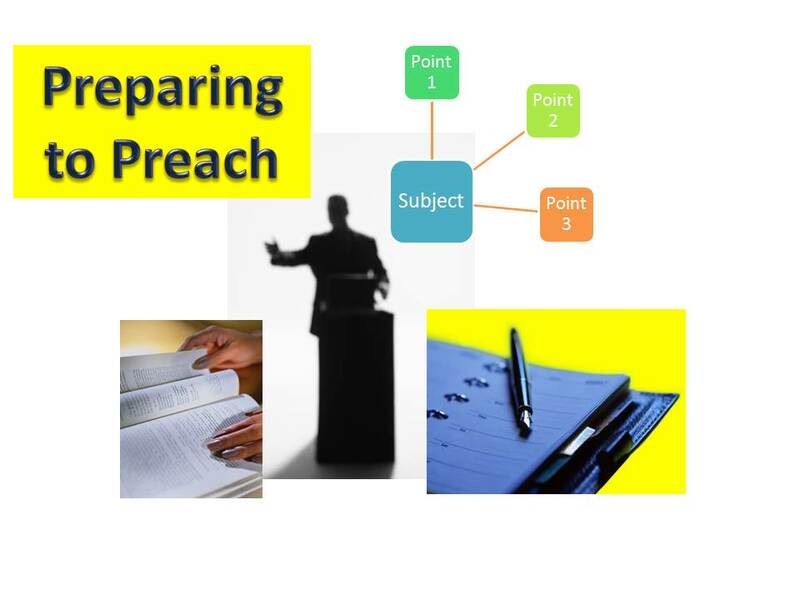 Use the fruit of intensive study to develop a sermon (or three), write bulletin articles using the points used in the sermon(s) or information that you could not include in the sermon (the darlings you killed) for immediate publishing or to keep in a collection for when time is limited, and copy the bulletin articles as blog posts to share with a broader audience. Often you can use material developed through a deep study to write class material or handouts you can give to people for questions related to that topic. Both the blog articles and handouts allow you to answer common questions by giving prepared information instead of recreating the wheel when questions come up. Finally, keep your notes, articles, handouts, class material, sermon outlines, source material, and other information in a place where you can pull it for refresher study or as the building blocks for future projects. I have a premium subscription to Evernote (Microsoft OneNote can work as well) so I can store PDF and other file formats and access them from my laptop, other computers via the web, and my smartphone. It is a great tool for free and even better for the $45/year premium upgrade. Efficiency allows you to spend more time in the study and service that is important for the kingdom of God. Difference in Sunday AM and PM Lessons? Whether one approaches the type of sermon preached on Sunday morning and afternoon depends on the audience. The places I preached full-time, we usually had more visitors on Sunday morning than in the evening (we only have Sun morning services were I preach now) so I might not preach such in-depth lessons. Sunday morning was usually first principles, basics of Christian living, etc. Please consider that probably 95% of the average worship attendance is comprised of those who are already Christians so preaching a lot of lessons on how to become a Christian is, in my opinion, wasted teaching opportunities. Focus on how to live the Christian life, the virtue and blessings of such a life, scriptural answers to life challenges, holiness, and answering specific false teaching and leave most of the “how to become a Christian” to personal studies with the non-Christians and studies with the young people. On Sunday evenings I might do a more in-depth studies on something like millennialism, Calvinism, etc. and training lessons such as evangelism and service. I heard advice long ago to not announce you are preaching a series. If the series is not going well, you can quietly abandon it if you have not announced it. Announce it, and you feel obligated to it even if it doesn’t seem to be working. I think either approach you described could work. The advantage of spending each lesson on it (or Sun morning and evening) is that the linking info from other lessons is fresher. If the future lessons depends much on the prior lesson I would absolutely keep them close. If the lessons tend to stand on their own, the one or two each month would probably work fine. 1 and 2 Timothy and Titus. Spend much time in these epistles for the instruction of the wise inspired apostle Paul to these preachers. They are a great source of encouragement, instruction, and exhortation. Common Sense Preaching by Dee Bowman is an excellent book written by an experienced preacher of the word. Letters to Young Preachers by various authors. If this book had only the letter by Sewell Hall it would be worth the price of the book. However, there are letters from many wise preachers on the work of preaching including teaching Bible classes and presenting sermons. I can’t recommend this too highly. Most of all, approach all parts of planning, study, and preaching with liberal time in prayer to God. Never forget, your service is to His glory, not yours.